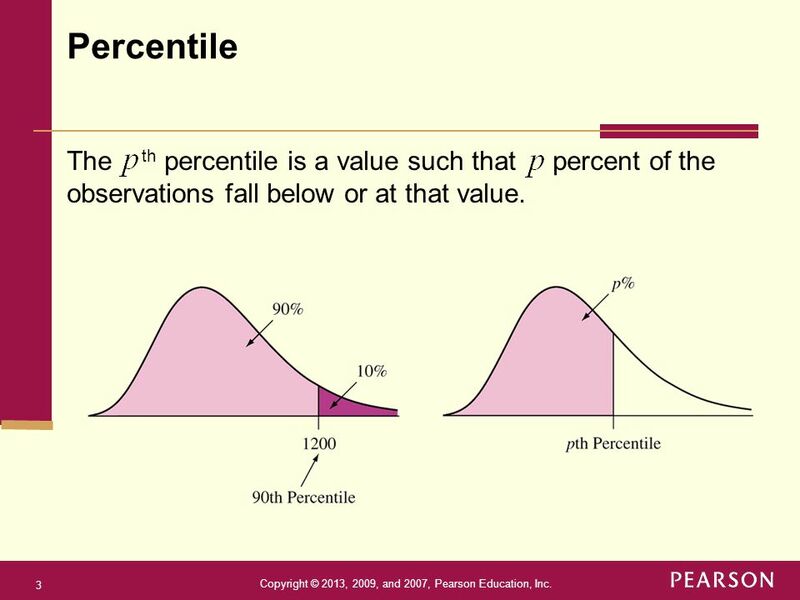 3 Percentile The th percentile is a value such that percent of the observations fall below or at that value. 4 Quartiles Figure 2.14 The Quartiles Split the Distribution Into Four Parts. 25% is below the first quartile (Q1), 25% is between the first quartile and the second quartile (the median, Q2), 25% is between the second quartile and the third quartile (Q3), and 25% is above the third quartile. 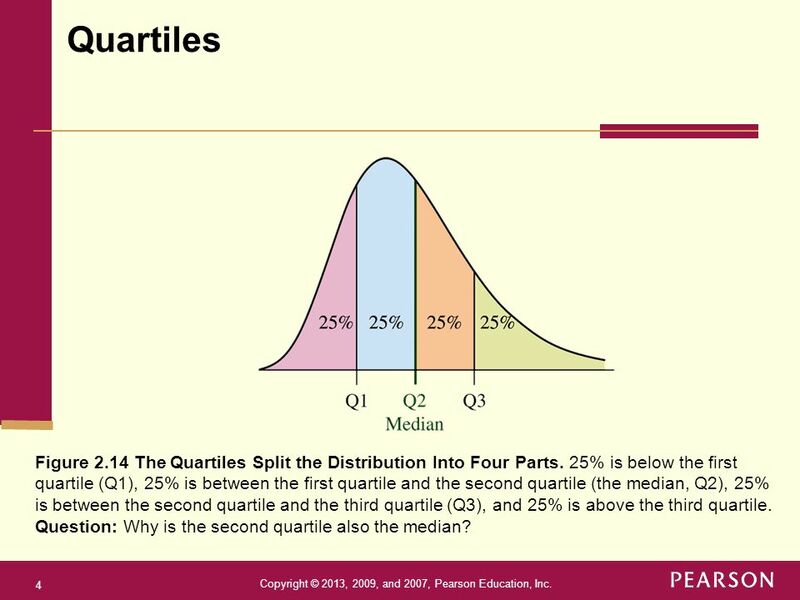 Question: Why is the second quartile also the median? Arrange the data in order. Consider the median. This is the second quartile, Q2. Consider the lower half of the observations (excluding the median itself if n is odd). The median of these observations is the first quartile, Q1. Consider the upper half of the observations (excluding the median itself if n is odd). 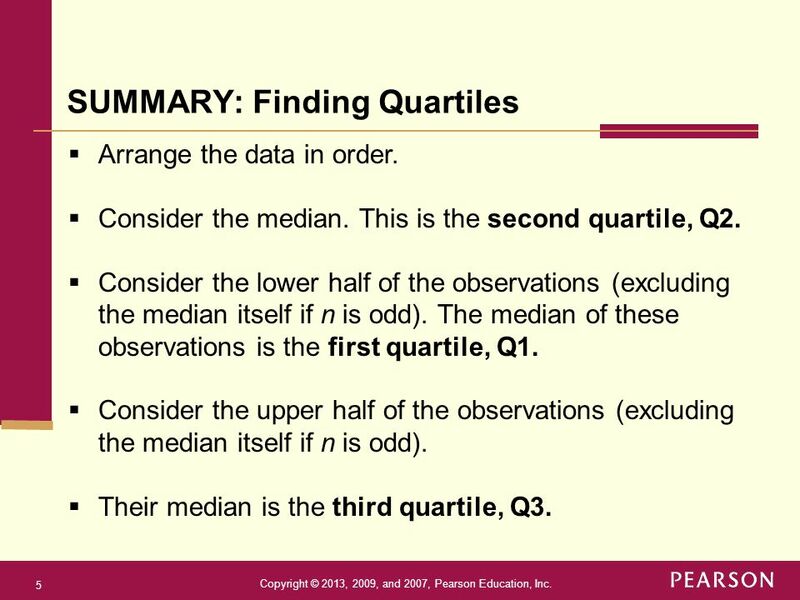 Their median is the third quartile, Q3. Consider the sodium values for the 20 breakfast cereals. 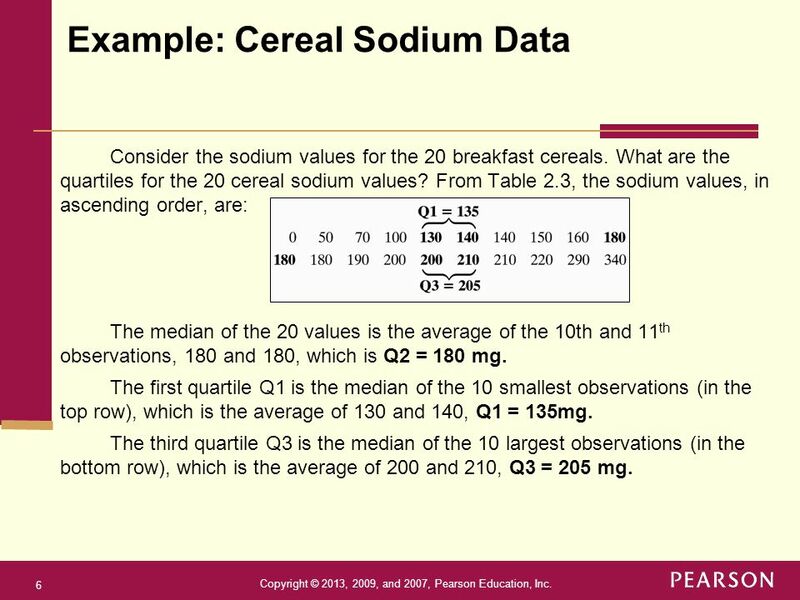 What are the quartiles for the 20 cereal sodium values? From Table 2.3, the sodium values, in ascending order, are: The median of the 20 values is the average of the 10th and 11th observations, 180 and 180, which is Q2 = 180 mg. The first quartile Q1 is the median of the 10 smallest observations (in the top row), which is the average of 130 and 140, Q1 = 135mg. The third quartile Q3 is the median of the 10 largest observations (in the bottom row), which is the average of 200 and 210, Q3 = 205 mg. 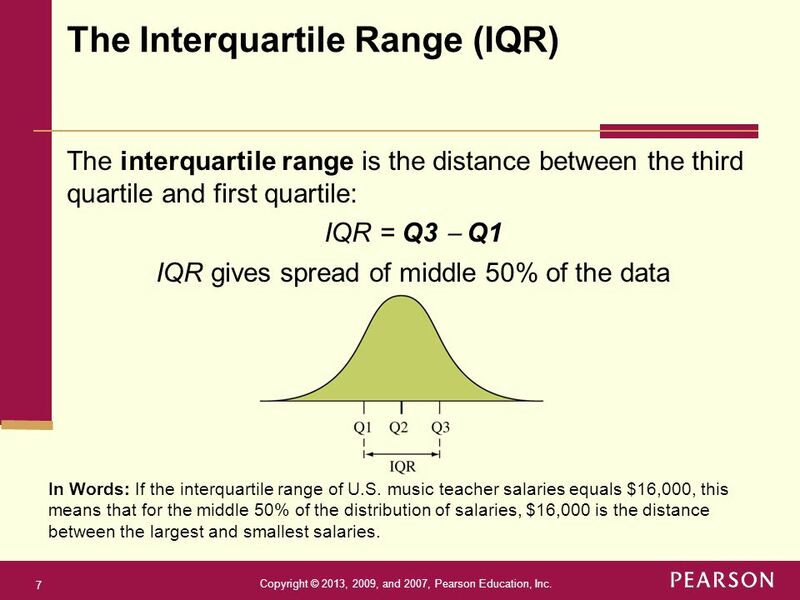 The interquartile range is the distance between the third quartile and first quartile: IQR = Q3  Q1 IQR gives spread of middle 50% of the data In Words: If the interquartile range of U.S. music teacher salaries equals $16,000, this means that for the middle 50% of the distribution of salaries, $16,000 is the distance between the largest and smallest salaries. Examining the data for unusual observations, such as outliers, is important in any statistical analysis. Is there a formula for flagging an observation as potentially being an outlier? 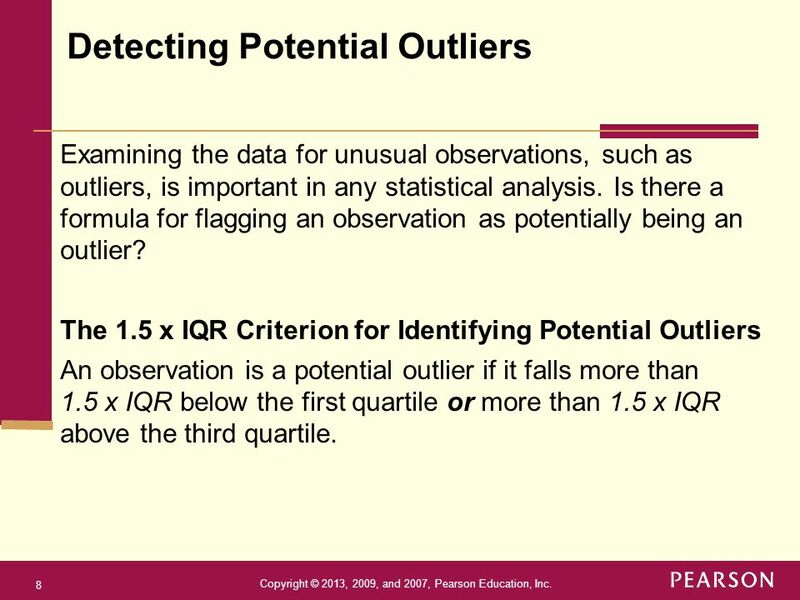 The 1.5 x IQR Criterion for Identifying Potential Outliers An observation is a potential outlier if it falls more than x IQR below the first quartile or more than 1.5 x IQR above the third quartile. A box goes from Q1 to Q3. A line is drawn inside the box at the median. 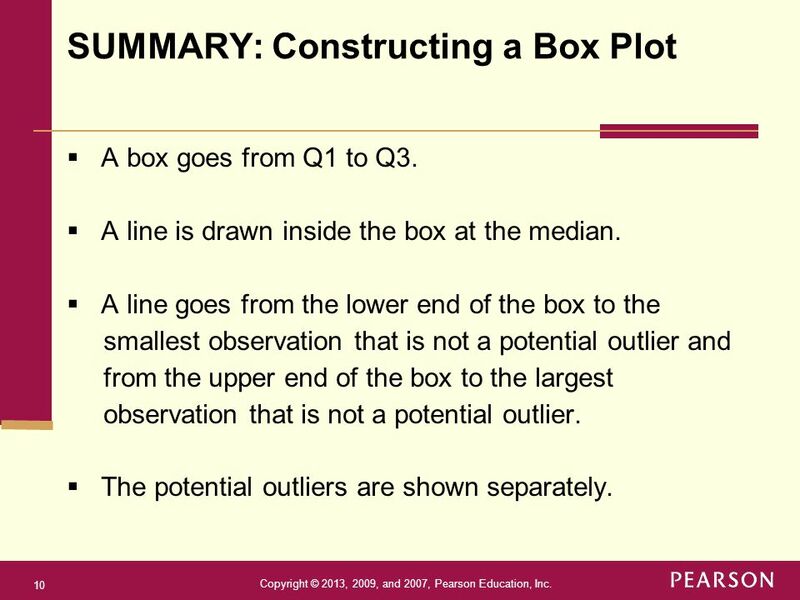 A line goes from the lower end of the box to the smallest observation that is not a potential outlier and from the upper end of the box to the largest observation that is not a potential outlier. The potential outliers are shown separately. Figure 2.15 shows a box plot for the sodium values. Labels are also given for the five-number summary of positions. 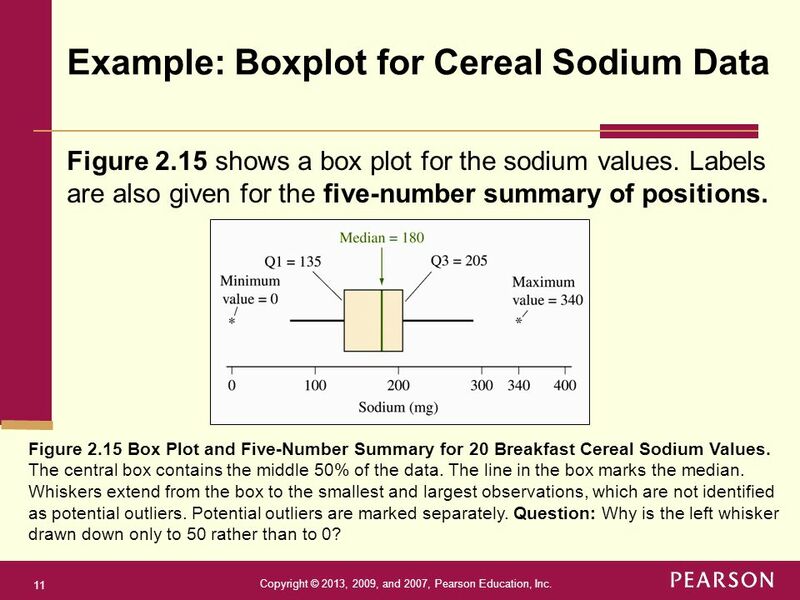 Figure 2.15 Box Plot and Five-Number Summary for 20 Breakfast Cereal Sodium Values. The central box contains the middle 50% of the data. The line in the box marks the median. Whiskers extend from the box to the smallest and largest observations, which are not identified as potential outliers. Potential outliers are marked separately. Question: Why is the left whisker drawn down only to 50 rather than to 0? 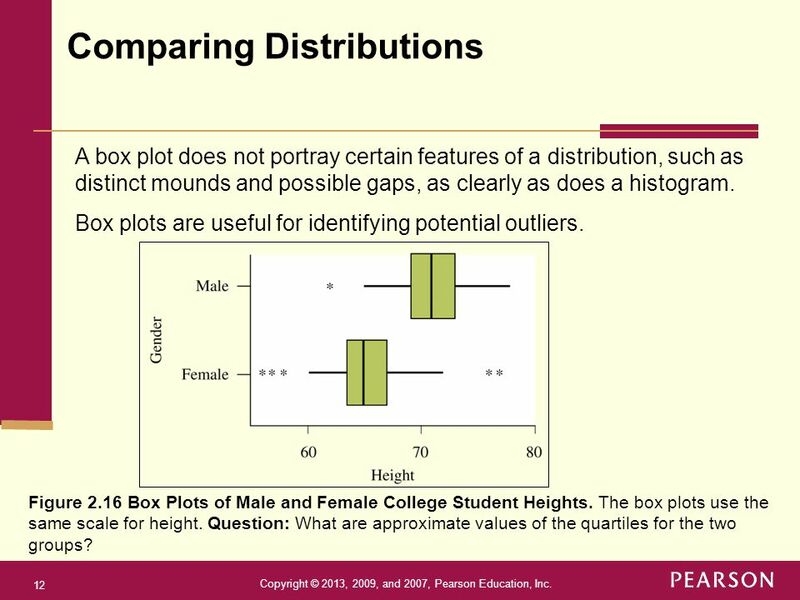 A box plot does not portray certain features of a distribution, such as distinct mounds and possible gaps, as clearly as does a histogram. Box plots are useful for identifying potential outliers. Figure 2.16 Box Plots of Male and Female College Student Heights. The box plots use the same scale for height. Question: What are approximate values of the quartiles for the two groups? 13 Z-Score The z-score also identifies position and potential outliers. 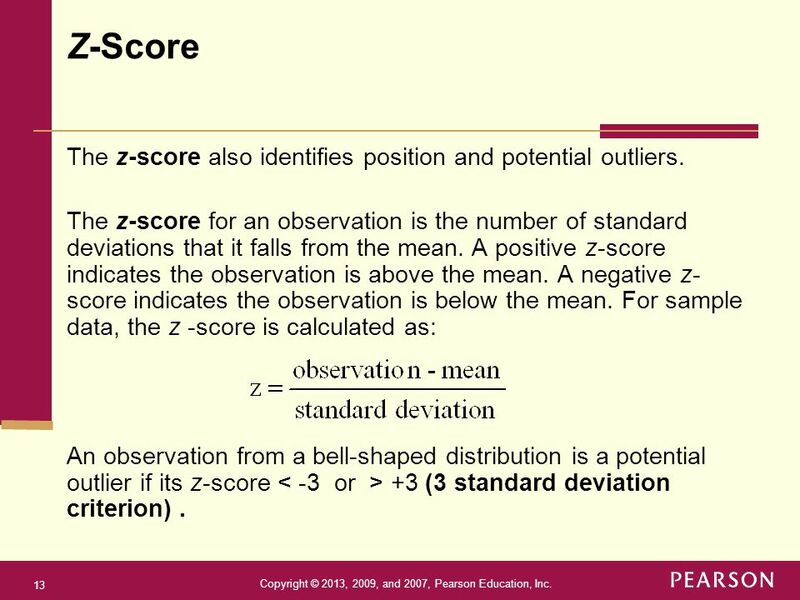 The z-score for an observation is the number of standard deviations that it falls from the mean. A positive z-score indicates the observation is above the mean. A negative z-score indicates the observation is below the mean. For sample data, the z -score is calculated as: An observation from a bell-shaped distribution is a potential outlier if its z-score < -3 or > +3 (3 standard deviation criterion) . 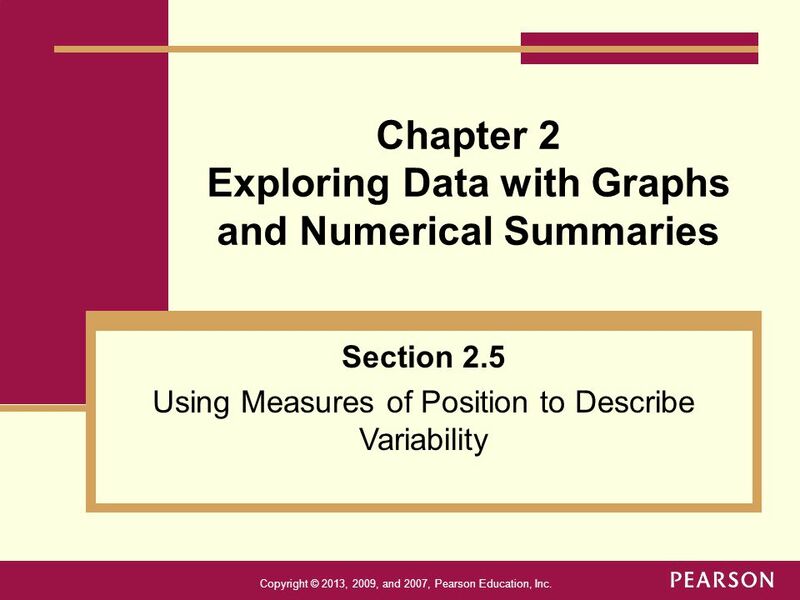 Download ppt "Chapter 2 Exploring Data with Graphs and Numerical Summaries"
Descriptive Measures MARE 250 Dr. Jason Turner. 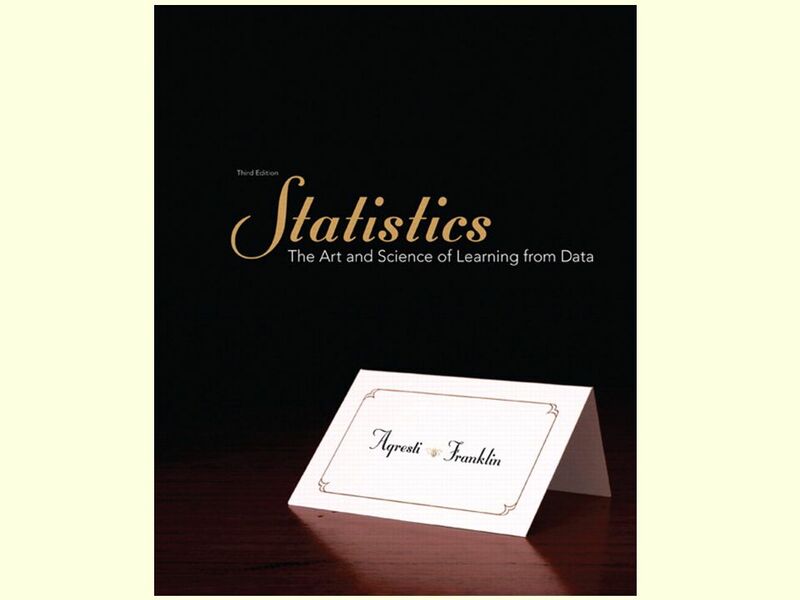 Agresti/Franklin Statistics, 1 of 63  Section 2.4 How Can We Describe the Spread of Quantitative Data? Chapter 13 Statistics © 2008 Pearson Addison-Wesley. All rights reserved. B a c kn e x t h o m e Parameters and Statistics statistic A statistic is a descriptive measure computed from a sample of data. parameter A parameter is. 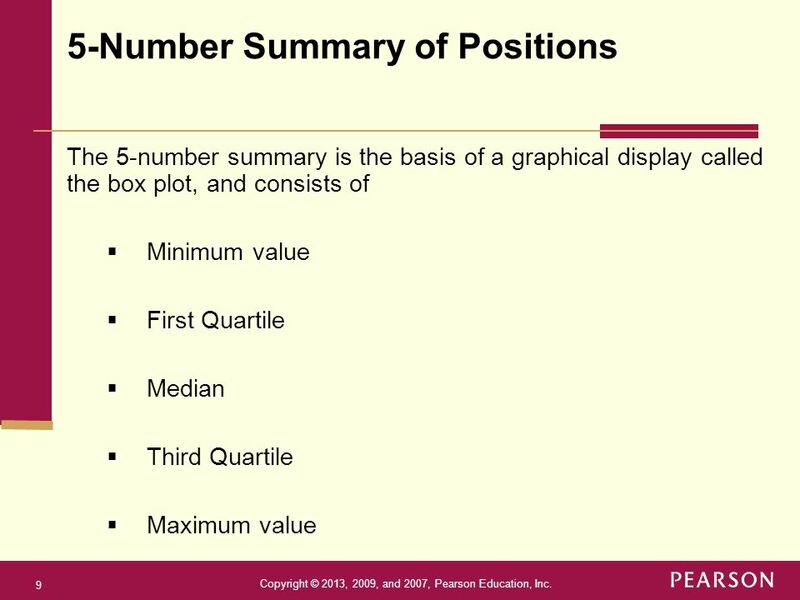 Sullivan – Statistics: Informed Decisions Using Data – 2 nd Edition – Chapter 3 Introduction – Slide 1 of 3 Topic 16 Numerically Summarizing Data- Averages. Copyright © 2005 Pearson Education, Inc. Slide 6-1.